When Hyundai unveiled the new Elantra and its now-famous Superstructure, the press was sceptical. What could possibly be so special about this chassis? But despite our collective doubts, the final product was impressive and refined, elevating the Elantra sedan among the leading compact cars. The same doubt crept up when Hyundai announced that they were working on a sport version of the Elantra sedan. Not the “bigger wheels and stripes” type of sport treatment, but rather the “new suspension and turbo engine” variety. 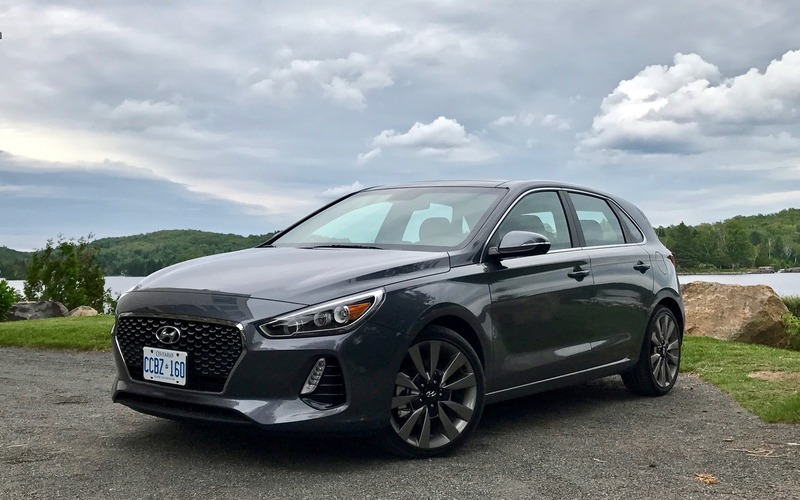 As it turned out, the Elantra Sport, which starts at $24,999, won me over with its dynamic ride, well-calibrated suspension and small-but-fun turbo engine. Also: The 2018 Hyundai Elantra GT? With these two back-to-back hits to Hyundai’s name, our expectations were running high for the new 2018 Hyundai Elantra GT, a European-designed hatchback. Essentially, we anticipated a Korean Volkswagen Golf GTI; less explosive, but less expensive too. But after spending a day aboard this new vehicle, we came away feeling slightly let down. Since conventional wisdom is that you should never change a winning recipe, Hyundai should have known better. The Elantra sedan offers impeccable style. It’s square, just aggressive enough, refined and hard to find fault with. 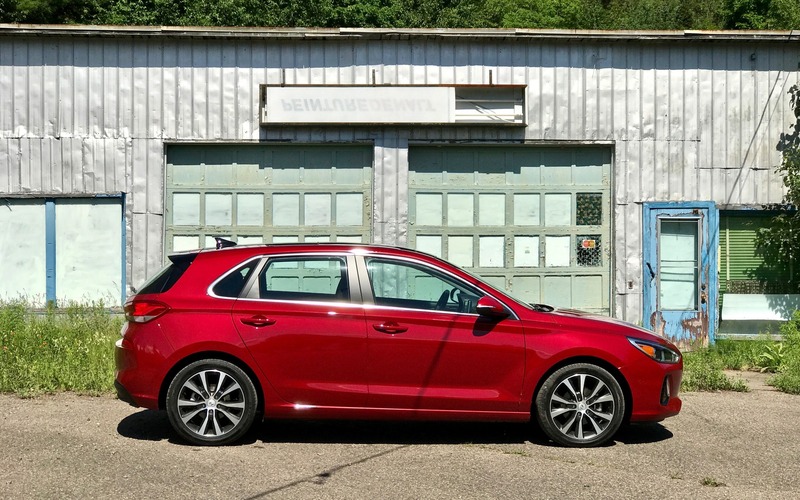 And yet the Elantra GT has a brand-new style that’s supposed to set the tone for future Hyundai products, like the much-anticipated new Accent. This new design breaks with the sedan’s looks, but that’s not a big deal. The problem is inside. The Elantra sedan’s passenger compartment is very nice, especially the dashboard, which is similar to the one in the Genesis. The Elantra GT’s cabin is different, with the screen being pulled out from the dash and plunked on top of it instead. When we showed the new look on our Facebook page, a lot of readers pointed out that several manufacturers have made this choice. And it’s true that higher screens are safer because drivers spend less time looking away from the road. But the new screen’s problem is its design. It might have been nice were it not surrounded by buttons. These buttons should have been positioned within easy reach at the bottom of the centre console. It’s too bad, because the cabin of the Elantra GT ends up looking less polished than the sedan’s. On the plus side, the screen displays an efficient infotainment system that’s compatible with Apple CarPlay and Android Auto. 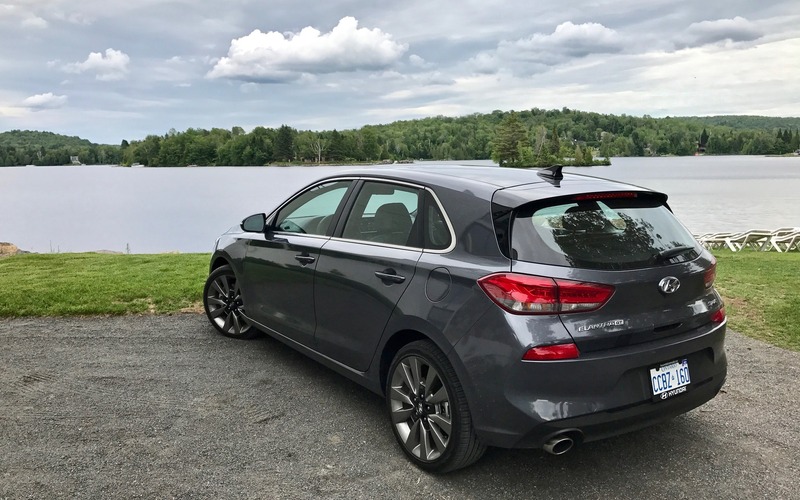 If the 2018 Hyundai Elantra GT is a self-respecting hatchback, it should be practical and roomy, right? Well, it offers more room in back than we thought, which came as a surprise because the GT is shorter than the sedan. But what really got us excited was the cargo capacity, which is 705 litres in the trunk and 1560 litres with the seatbacks down (compare that with 645 and 1492 litres in the Volkswagen Golf)! The Elantra GT is available with two excellent engines. First there’s a 2.0-litre four-cylinder with direct injection that offers 162 horsepower and 150 lb.-ft. of torque. This means that the Elantra sedan’s snore-worthy 2.0-litre Atkinson mill hasn’t made its way into the GT. This engine is paired with a six-speed manual transmission or an optional six-speed automatic. The Elantra GT Sport is equipped with a 1.6-litre four-cylinder turbo that delivers 201 horsepower and 195 lb.-ft. of torque. It’s mated to a very pleasant six-speed manual transmission, though you can opt for a seven-speed dual-clutch gearbox. This optional gearbox is fast and efficient, but it’s not nearly as fun as the manual. If your daily drive includes a lot of traffic, it’s not a bad choice. While the 2.0-litre mill is good enough for everyday getting around, the turbo is genuinely fun. Its power is linear and you find yourself pushing the engine just for the fun of it. And yet. The engines are good, but the 2018 Hyundai Elantra GT’s handling leaves something to be desired. The steering feedback is elastic and even if you activate Sport mode, it remains the same, or like a more tense elastic. The chassis is rigid, but the suspension seems to have been calibrated for comfort, to the detriment of performance. We can justify this in the base version, but not in the Sport version. Compared to the Elantra Sport sedan, the GT Sport is softer, with a less captivating ride. We were expecting a bargain-priced GTI, but what we got was an everyday hatchback with a spunky engine. Pricing hasn’t been unveiled yet, but we were told they would be similar to the sedan’s. This means the Elantra GT Sport should start at around $25,000. 8/10	The Elantra may not be sporty, but it’s comfortable. 9/10	We couldn’t ask for more. 6/10	Soft ride. Not as good as the sedan’s. 7/10	Not very GT in the end. Paris The 2018 Hyundai Elantra GT? New Models The new Hyundai i30 N Revealed!